James and Ann started making pizza in a camper trailer on the side of the road in Portland, Oregon. Over a four year period we learned how to make great pizza and build a loyal following. We have always loved time spent in outdoor environments and have hiked and camped extensively through the Appalachian and Cascade mountain ranges. The name Wy’east comes from the native name for the mountain we now call Mt. Hood, Portland’s namesake mountain and the source of much of our inspiration. We moved back to our hometown Milwaukee Wisconsin in 2013 so that our families could eat our pizza too. There may be times when we may not be able to answer all phone orders. Friday and Saturday nights are often busy and we are not always able to take phone orders. We apologize for the inconvenience. We are taking phone to go orders. During busy times we may not be able to answer all calls. We do not take voicemail orders. A rotating white pizza that highlights seasonal vegetables, fresh herbs, and specialty cheeses from local purveyors whenever possible. No additions or substitutions. Base of tomato sauce, shredded mozzarella, pecorino cheese and herbs. Up to 3 add ons, including only 1 meat. * contains nuts or fish which may be an allergen all pizzas and foccacia contain gluten. olives may contain pits. Raised Grain "Black Walnut Belgian Imperial Stout"
A very hot oven and a long fermented dough are the essential ingredients for a great pizza. We honor age old bread baking traditions, so naturally the dough is the most highly regarded component of our pizza. Our crust is thin with an outer edge that puffs up and shows its bread like structure. This edge is the cornicione, it is the result of the long fermentation and hand stretching process. The pies are baked quickly so that they do not dry out but get crispy and slightly charred in all the right places. This char is a natural product of carmelizing sugars in the dough released from it’s long fermentation and the extreme heat of the oven. Char, and the flavor contrasts it provides are highly sought after by both pizzaiolo’s and critics alike. AVAILABLE TO PRE ORDER: Pizza style Focaccia pre ordered half and quarter sheets, we do need to know a week in advance in order to make sure there is dough avaialble. We are a small counter service business. To achieve an even flow during service, all pies are made in the order we receive them. We are taking phone orders for to go pizzas only, in the order received. We may not be able to answer all calls during busy times, we do apologize for the inconvenience. We do not take voicemail orders. We do take walk in to go orders. Maximum to go orders are limited to 4 pies because the less time between pizza out of the oven and into your mouth means the happier you will be. Our dough goes through a long and precise preparation, therefore only one batch of dough is made per day. If we happen to run out on a busy night we have to stop taking orders. Because of our size we are unable to accommodate reservations and large groups, parties should be no more than 6 guests. Gift Certificates We do have paper gift certificates available for purchase at the restaurant. 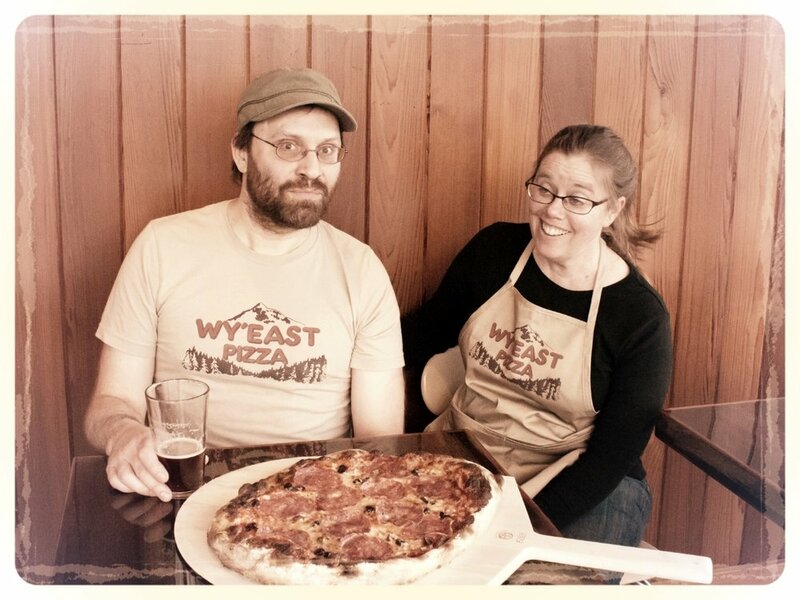 "Wy'east makes pizzas at their peak"
"Wy'east's crisp, lightly charred 12-inch pies rival any restaurant's." "A reverence for simplicity that comes through in the New-York-meets-Neapolitan handcrafted pizzas." "All dough is made by hand....the pre-ferment starts the night before and goes 12 hours, then the final dough is mixed and ferments for another 6 for a total of 18 hours." "The crust was crisp-chewy, nicely browned, and the toppings and sauce were top-notch."